Brush 4 ramekins with melted butter and chill till hard. Brush with more melted butter and add a spoonful of cocoa powder. Roll the powder around until all the butter is covered. In a bowl, place the butter and the chocolate and heat in the microwave for 1 minute to melt. Stir until smooth. In a large bowl, whisk the eggs, yolks and sugar until thick and pail and it leaves a trail. Sift the flour into the egg mixture and beat well. Add the chocolate and beat well to form a thick batter. Pour equal amounts into the ramekins and chill in the fridge for 1 hour. Heat the oven to 200C. Bake the fondants on a baking tray for 15 minutes. Remove from the oven and let stand for 1 minute. 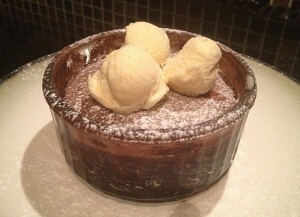 The fondants should be firm, but have a molten chocolate centre.